A Peaceful Place To Be: Four eggs and a new door! 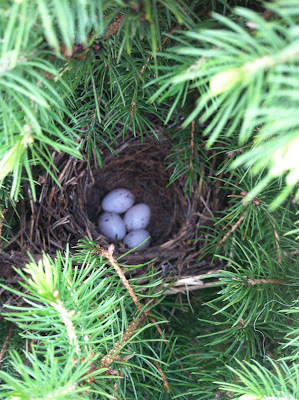 Yesterday we woke up to find that the nest has survived the storms the last couple of days and now there are four eggs! The weather has suddenly turned cold again (in the low 60's) and today the mama is sitting on her eggs. When we go to check she just sits there very still probably hoping we won't hurt her. No mama - we're making sure everything is okay! So, we are cruising along on our "to-do" list around the house but my question is this, "Why can't anything be easy or go smoothly?" It's always something, isn't it? Nothing major, just little annoyances along the way. First, the patio. Now, it looks beautiful but we had to go round and round and had to ultimately go with the *most expensive option* due to an error that was made when the house was built three years ago. The patio turned out beautiful and even better than I thought it would and I am enjoying it immensely. I'm still working on the surrounding landscaping and decorating the patio itself but I just love the flagstone. Next up was the garage project (no pictures just yet). That is actually still a work in progress in that we have to finish organizing. It took WEEKS to have the sheetrock and insulation removed and a huge dusty mess replacing the sheetrock with the bullnose edges. I couldn't wait to get to the painting phase where they would paint it a new, light color and just make the space feel so much better. In the middle of painting the guy went out for lunch and I checked his progress he had painted it the WRONG color! At first I was so upset since I had only told the project manager about 10 times I wanted a *new* color AND had called him the week before with the specific color I wanted. But, I decided to calm down and just tell the painter he would have to repaint the correct color and he did. Whew. Finally, our custom front door. The door itself is beautiful and it lets so much light into the front hallway. I can't believe we didn't spring for this when we first moved in. Anyway -we were all excited that it was installed until we realized the company didn't put hinges on the glass panel so I can open it for easy cleaning. We paid extra for an operational glass door and we got one that is welded shut. So a call to the door guy and they have to build us a new panel for the door that will take several weeks. Also, new trim had to be put on the outside of the door so now that has to be painted along with the trim on the inside of the door that had to be removed and reinstalled for the new door. In the scheme of things, I know these are minor annoyances - NOT major problems. I have to laugh that what seems like a simple project always involves more time and effort than what I originally think it will but the final result when all is said and done makes me wonder why it took me so long in the first place to get these things done. Tonight we are off to see John Michael Montgomery at the Riverspirit Casino and tomorrow we have a wedding to attend so - a busy weekend for us! 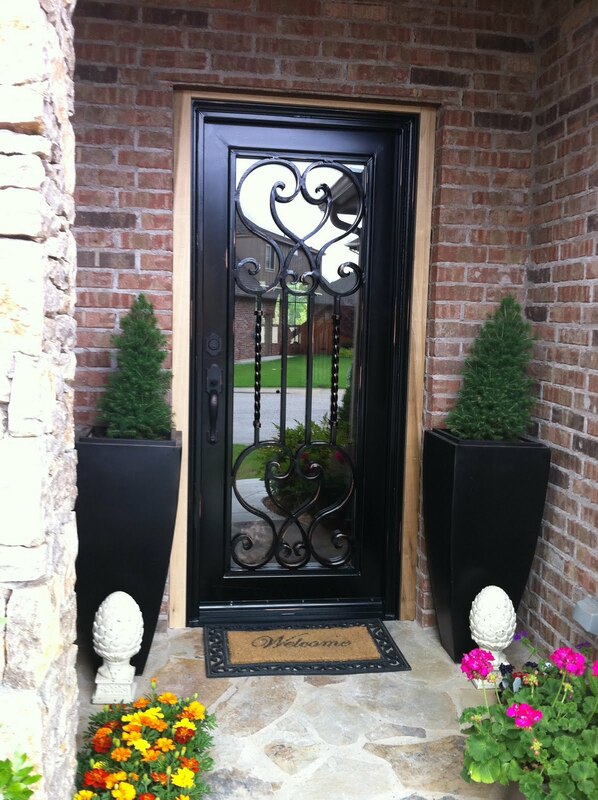 Love the new front door. We have always wanted to do something like that for out door because it is so dark. Thanks for the picture. I may call you for the company the front door came from. Oh, a gorgeous door! We have a flagstone patio, too, and love it! I love it so much more than a deck! let us know when those eggs hatch! how lucky you are!